At the last school board meeting Harry Wiggins, Chairman of the PWC Democratic Committee, addressed the board. He stated that PWCS had the lowest test scores in the area. Dr. Otiagbe appeared taken aback by that and asked the Superintendent to address it. The Superintendent responded that PWCS consistently exceeded state averages but didn’t elaborate further as it was quite late. Confusing, isn’t it? I’ll try to break it down a bit. This summer, after receiving a wavier from NCLB’s 100% passing requirements, the VA Dept of Ed established new goals for the percentage of students passing the SOL in all school divisions and public schools in the state. The new targeted percentage passing was set for the state overall and for groups of students; groups that are based on race. 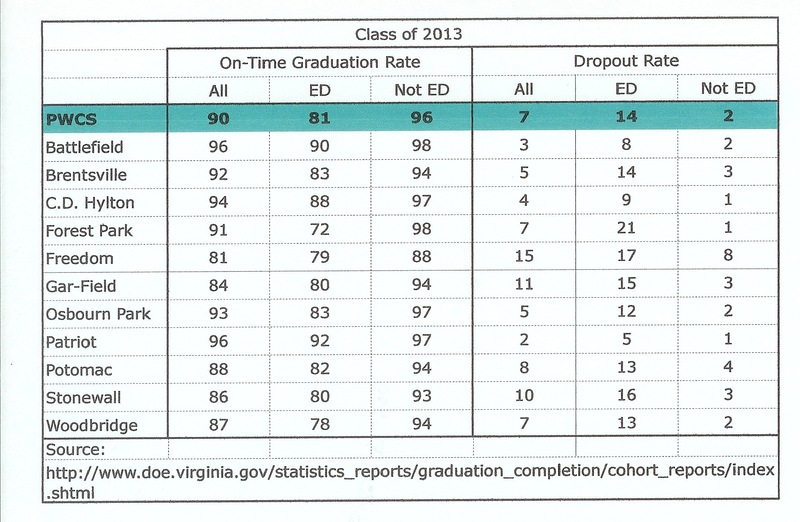 The Va Dept of Ed took lots of flack from the public because the pass rate targets for 2013 – 2017 for Black and Hispanic students are lower than the pass rate targets for White and Asian students. The Dept of Ed was accused of having lower expectations for Black and Hispanic students than they do for White and Asian students. The VA Dept of Ed responded that the goals don’t reflect lower expectations for Black or Hispanic students as the final goal, 73% passing by 2017, is uniform across all groups. Instead of setting a uniform starting point that didn’t reflect actual pass rates, the Dept of Ed set the 2012 actual pass rates as the point from which annual increases are expected. The goals for annual increases for Black and Hispanic students, according the the Dept of Ed, will be challenging but are achievable. Unfortunately the Dept of Ed blew off White and Asian students as they aren’t expected to improve at all. According to the Va Dept of Ed, the percentage of Black and Hispanic students passing the SOL exams is expected in increase nearly 20% over the next 5 years, but no increase is expected for White and Asian students. In these times of scarce resources, with pressure on school divisions to meet state pass rate targets, where do you think the resources will be allocated – to the schools that are struggling to meet the state pass rate targets or the schools that have already met them? If every child deserves an education that helps them achieve the most they can, is that fair? Wouldn’t it be more fair for the state to expect the percentage of students passing the SOLs to increase in each and every group, not just in select groups? If you have any concerns with the goals the Dept of Ed has established, you may want to contact your state representatives. Every organization, whether private or public, is evaluated on how well they do their jobs. For private companies that evaluation comes from their customers, who will go someplace else if they’re dissatisfied. Because government entities are monopolies and citizens, for the most part, don’t have alternatives to choose from, evaluating performance for them is a bit more complicated. Police departments are evaluated based on crime rates, fire departments are rated on response times, and schools are rated on test scores. At the January 16, 2013 School Board meeting, PWCS requested board approval of a few changes to the Strategic Plan. These changes were characterized by Chairman Johns and Dr Walts as “semantic” in nature and were necessary because the state had received a waiver from NCLB and reset the Annual Measurable Objectives (AMO’s) for school divisions. AMOs list, among many other things, the targeted percentage of students expected to pass the SOL exams each year. The school division requested that the proposed changes be presented and voted on the same night. At the time I’d requested that the school board delay voting on the proposed changes to give citizens time to understand and examine them and provide feedback to their elected officials before the vote was taken. Citing the “semantic” nature of the changes, the school board voted on the changes on the 16th and approved them. I think this was a poor decision. Blame the teachers. That’s the advice from PWCS for anyone with concerns about the Math program. According to PWCS staff, teachers developed the assessments and have the authority and autonomy to select and use any materials they want in any order no matter what the recommended pacing might suggest. Teachers can even disavow instructional materials entirely, if they so desire. Lesson pacing is just a suggestion, not set in stone, and teachers can teach lessons in any order they want based on what they believe will best meet the needs of their diverse community of students. Our teachers teach the curriculum, not a textbook. Any concerns or questions anyone has with what’s being taught, the manner in which it’s being taught, the order in which it’s being taught, what’s being tested, or how responses are being graded needs to bring those concerns to the attention of their child’s teacher. Central office, and the Math Department, exist solely to create learning environments to enhance teacher professional development and student learning. Got that teachers? According to PWCS, when it comes to Math, it’s all on you. If any teachers are feeling like they just got thrown under the bus by PWCS, watch out for the tires, they sting. Tell them that students should be able to add, subtract, multiply, and divide without calculators BEFORE they’re forced into Algebra or higher level courses. Heck, tell them to order the VA DOE to stop pushing calculators in our elementary school children. Tell your Delegates that you support HB 469. Tell your school board members not to oppose it.